Hawaii offers a melting pot of cuisines with Asian, Polynesian, American and European influences. A number of prominent dishes trace their origins from such diverse influences. Examples include: saimin, lomi salmon, loco moco and many others. But one of the most delicious and popular of such foods is Portuguese sweet bread in Hawaii. During the late 19th century, Portuguese immigrants arrived in Hawaii from the Madeira and Azores islands. These Portuguese immigrants primarily worked on sugar plantations. They brought many influential traditions with them. In addition to the slack-key guitar and ukulele, Hawaii’s Portuguese immigrants also introduced many foods. They included Portuguese linguisa sausage, malasada, Portuguese bean soup and pão doce or sweet bread. 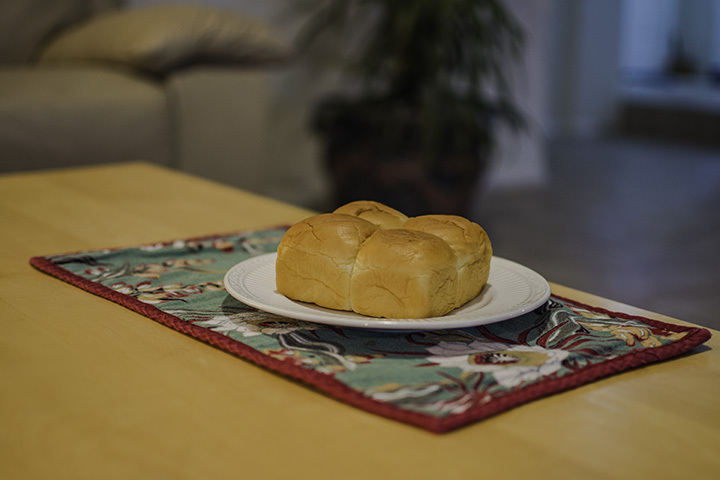 Since the early 1900’s, Portuguese sweet bread has been a popular dish in Hawaii. Hawaii’s version of Portuguese sweet bread has now taken many forms. As a result, it may not have the same classic appearance of traditional pão doce. Today, there are a number of bakeries making sweet bread in the form of rolls and hamburger-sized buns. They can also be found in just about any supermarket in the islands. There are even numerous restaurants that bake their own version of the mouth-watering bread. But in general, people no longer refer to them as Portuguese sweet bread. Instead, most now simply refer to them as sweet bread. Some enterprising companies even refer to them as Hawaiian sweet bread. But make no mistake, the latest generation of sweet breads in Hawaii owe their existence to Portuguese immigrants. They were the ones who taught the people of Hawaii how to bake as well as enjoy them. In the 1960s, people would often call sweet bread by its Portuguese name, pão doce. The place get one of the most traditional form of Hawaii’s pão doce is at Leonard’s Bakery. You can find it in the Kapahulu area of Honolulu. Here, a family whose ancestors originally came from Portugal in the late 1800s makes pão doce. They bake it in a form that somewhat resembles a baseball catcher’s mitt. Besides offering high quality baked goods for many generations, Leonard’s Bakery is an important cultural icon. It has become a symbol of Portuguese influence on the history and culture of the Aloha State. Punalu’u Bake Shop on the Big Island is near black sand beaches and Hawaii Volcanoes National Park. This makes it the perfect stopping place for day-trips. They sell sweet rolls, guava sweetbread tortes and sweet bread pudding. For those on the mainland, Punalu’u can ship their baked sweet bread and malasada mix to your doorstep. Ani’s Bake Shop in Aiea on Oahu makes sweet bread and the fluffiest sweet bread loaves imaginable. Visitors should make a special trip to Ani’s when they are on Oahu. As noted in its name, Liliha Bakery, a favorite of locals, is in the Liliha area of Honolulu. Here, you can find freshly made Portuguese sweet bread, but also their famous cream-filled coco puffs. On the Big Island, the Kona Historical Society demonstrates the traditional Portuguese stone-oven method of baking pão doce. They start by heating a large stone oven for several hours. Workers then mix the tasty dough, letting it rise before forming 7 buns in a flower-like configuration. After that, they bake the bread and sell it to anyone wanting to taste a morsel of the past. The society holds weekly demonstrations on Thursday from 10 am to 1 pm. So on-lookers can now see how immigrants originally made Portuguese sweet bread in Hawaii.